The origin of the Dalmatian is uncertain. Dalmatians thought to come from India with traders, but it was developed chiefly in the United Kingdom. From the 1920s on, the breed became popular across Europe due to its characteristic spotted coat. These days the Dalmatian is used as a rescue dog, guardian, a ‘life coach’ because of its athletic prowess and love of a run, and a companion dog. They are perhaps best known as the mascot adopted by firemen to protect fire stations and the equipment in them. Dalmatians cleared the way of stray dogs for horses, ratted in stables and guarded the horses and carriages. After the novel The Hundred and One Dalmatians was published in 1956, the breed became extremely popular. It became even more popular after the two Walt Disney movies and suffered greatly at the hands of people who didn’t understand its high maintenance when it comes to exercise. Dalmatians are enthusiastic and friendly, very loyal to those they know and trust and a little aloof with strangers. They can be boisterous but easily trained to go jogging and horse riding, or do agility, flyball and tricks. Dalmatians are good guard dogs and need regular vigorous exercise every day. They are a high-energy breed that needs an owner who understands this. They need an average to large back garden but need a morning and evening walk to burn off energy and provide stimulation. 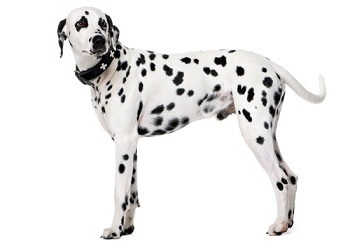 A Dalmatian sheds a lot of white hair and needs a weekly brush or wipe down to minimize this. Dalmatians do not have much of a doggy odor and only need an occasional bath. They are a very energetic dog with great stamina and love to run. Like all dogs, Dalmatians need regular training using positive rewards rather than harsh punishment. They require long, daily walks and can become destructive if they are bored. Like all dogs, Dalmatians require regular tick, flea, intestinal worms and heartworm treatments. Consult your veterinarian on treatment options. Desexing and vaccination against diseases, such as the deadly parvo virus and highly infectious canine cough, are also important to discuss with your vet. This is an athletic dog and not ideal for elderly people or families with toddlers. It is more suited to active people who like to run and jog with a dog by their side. Dalmatians are not ideal for apartment living unless they get sufficient daily exercise. They are also not suited to living outdoors in cold climates. They are active indoors and are happiest in at least an average-sized yard. When buying a Dalmatian, ensure your puppy has been BAER hearing tested by the breeder as deafness is a common hereditary problem in the breed. Common hereditary problems Deafness, allergic dermatitis and uric acid bladder stones. Rare problems Arthritis, hip dysplasia, osteochondrosis elbow and auto-immune thyroiditis.